George P. Barich is the Principal of ISU Barich Insurance Agency. George, a longtime resident of Redlands, is passionate about working and giving back to his community. In January 2013, George had the prestigious honor of being named Redlands 2012 “Man of the Year." George grew up in the city of Redlands, graduating from Redlands High School in 1975. He served as Senior Class President and Captain of the Swim Team while also playing Water Polo. In 1979, George received his Bachelor’s Degree in Business Administration (BBA) From Loyola Marymount University. During college he played Water Polo, serving as Captain his senior year, and is a proud member of Alpha Delta Gamma Fraternity. He also served as the Student Manager for the Recreation Center. 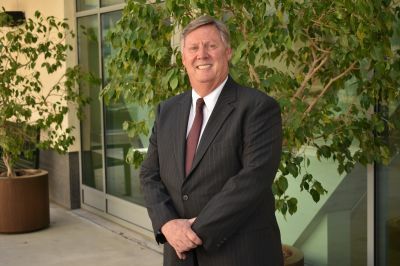 He continued his education at LMU earning his Master’s Degree in Public Administration (MPA) in 1984. George has been active in the Insurance business for over 26 years. He holds the following State of California Insurance licenses: Property and Casualty, Life, and Accident and Health. He has also received the following Insurance designations: CLCS (Commercial Lines Coverage Specialist) and PLCS (Personal Lines Coverage Specialist). George has served on the Agent Advisory Board for CIG Insurance Company. Prior to entering the Insurance business, he worked for GTE in various regulatory, marketing and sales, and management positions. George continues to be active in his community, currently serving on the following Non-Profit Boards of Directors: Chairman of the Redlands Community Hospital Foundation, Redlands 4th of July Committee, and the Redlands Community Hospital Board. Other Boards he has served on include The Redlands Noon Kiwanis Club, Redlands AYSO, Los Gauchos Soccer Club, and the Redlands High School Cross Country Team. He is an active member of Redlands Noon Kiwanis Club having served as Club President from 2008-2009. He has been recognized with the following awards: Kiwanian of the Year, Rookie of the Year, Hammerhead of the Year, and Most Inspirational. He was also honored by the Redlands Rotary Club receiving the “Paul Harris Fellowship Award” for outstanding community service. George served two years as President of the Redlands Service Club Council leading various community service and work related projects. He is an active member of Holy Name of Jesus Church and is a Fourth Degree of the Knights of Columbus. In his free time, George and his wife Kathy, enjoy spending time with their three adult children and one adorable grandson, cheering for the Notre Dame Fighting Irish and Arizona Cardinals, volunteering, trying to play golf and traveling.